History: Cazador was once a mercenary who arrived in the Americas seeking riches, only to be imprisoned by a native curse, condemned never to die and to undergo the passage of the ages as one of the undead, unaware that he was now also an envoy of the Satanic powers. 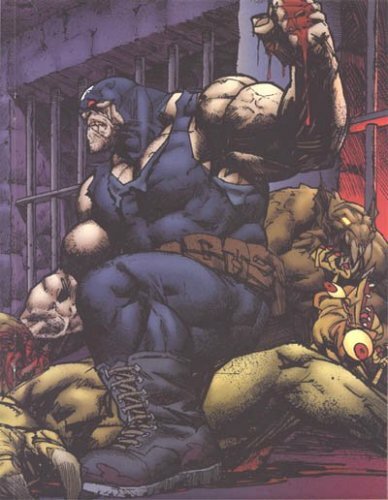 By the modern day, Cazador was a brutish superhuman who lived in a derelict Argentinian church, a fanatical "defender of the faith". Robert Howard was a scientist working for NASA who was charged with investigating a cylinder extracted from a downed UFO. Realising that the military intended to use his discoveries for destructive purposes, Howard refused to continue his investigation, only to have his family murdered in an explosion. Desiring revenge, Robert Howard adopted the costumed identity of Cazador. Thanks to Fernando Mansilla for images of this character, to Martín Tourreilles for background information, and to Gerardo Suarez for information on his history.